Kettlebells are shipped within the Continental United States only. Kettlebells have been used for centuries for strength and fitness. Current day kettlebell lifters range from everyday working men and women to firefighters, martial artists, and special forces operators. The shape of the bell, and types of exercises that can be done with them, make them an excellent tool for fat loss, explosive strength, endurance and healthy longevity. These Ader Kettlebells are fully cast iron, with a fully cast handle and no welding. 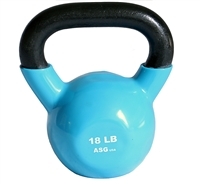 Ader kettlebells are widely known for their outstanding handle quality. The black hammer tone paint provides a light texture that is not slick or slippery, making the handle ideal for both high repetition exercises and heavyweight pressing lifts. The perfect width of the handle easily accommodates both hands of men or women for two handed exercises. An Ader Kettlebell will be the last kettlebell you purchase.